Editors Note: The Square Deal welcomes Liz Geraghty, Vice President of Brand Marketing. Since joining the Wendy’s family in 2007, Liz has served in a number of marketing and innovation roles, leading the development of several award winning products including the Pretzel Bacon Cheeseburger, Apple Pecan Chicken Salad, and the 4 for $4 Meal Deal. Part of her current role is to help craft the strategy around how Wendy’s activates our long-standing commitment to children in foster care through support of the Dave Thomas Foundation for Adoption. As a mother, daughter, sister and wife, I can’t imagine my life without the presence of family. Working to raise awareness and funds to give children in foster care the experience of a loving family is one of the most rewarding aspects of my job at Wendy’s. It is so inspiring to realize that every time we help a child in foster care find a family we are literally changing a child’s life. At Wendy’s we have a wonderful tradition of celebrating our birthday and honoring our founder every year during Founder’s Week. This year, we make Founder’s Week even more special with the introduction of National Adoption Night. Tonight, on November 15, more than 90 percent of our restaurants will donate 15 percent of their evening sales to help local children in foster care find loving homes. We’ll make helping children in foster care as easy as eating dinner! 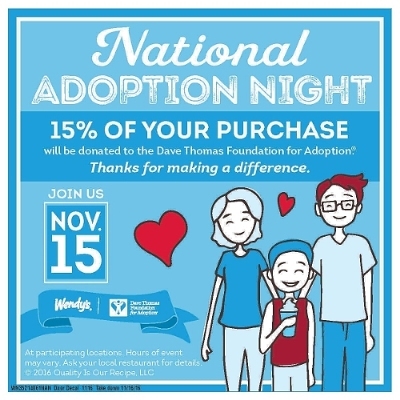 Being able to partner with our customers to fund the Dave Thomas Foundation for Adoption is part of the way that Wendy’s lives out Dave Thomas’ charge that children in foster care aren’t someone else’s responsibility, they are ours. As an adopted child, Dave Thomas understood that kids in foster care are often faced with feelings of fear and loneliness, but all that can change on the day they are adopted. He grounded us in the importance of having a family to belong to. Since its founding in 1992, The Dave Thomas Foundation for Adoption has been driven by a single goal: finding a loving family for every child waiting in foster care. Through the financial support of Wendy’s and its customers, it’s been able to continue to deliver on this goal for over 20 years. So we hope you’ll join us for dinner tonight to help us continue to make family a reality for these children.